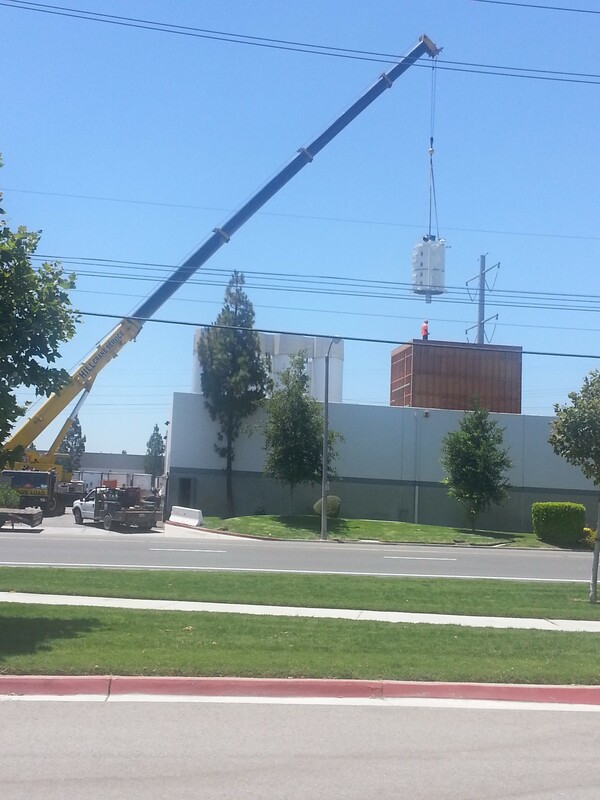 The final stages of equipment installation are underway at Envision Plastics’ Chino, California operation as a large crane lowered the EcoPrime™ vessel through the roof of the building and into its framework. The EcoPrime™ vessel is the final component required to allow Envision to produce EcoPrime™, FDA approved food grade recycled HDPE resin on the West coast. EcoPrime™ is approved for direct food contact in many food and beverage applications under demanding conditions of use. EcoPrime™ is currently used in packaging for liquid yogurt drinks, cereals, deli foods, nutritional products, food take out containers, personal care products, toys and other products. It can be used in blow molding, thermoforming, compression molding, film extrusion and some injection molding applications. Debugging of the equipment and pre-production trials will take place in July. Production of EcoPrime™ should commence in August. Stay tuned for more developments. Arla Foods has appointed leading plastic packaging company, Alpla, to manufacture bottles on site at its new one billion-litre dairy in Aylesbury, and support Arla’s aim for the dairy to be the most environmentally advanced in the world. Alpla, which is targeting an industry first recycled HDPE material content of 50 per cent in all bottles for Arla, will support the dairy company’s aim of delivering a zero carbon facility with zero waste to landfill in Aylesbury. Alpla has already designed a new range of lightweight HDPE bottles, which will deliver a weight saving in excess of 20 per cent compared to Arla’s current milk bottles. Alpla will work at Aylesbury dairy through a ‘hole-in-the-wall’ operation. Although on site bottle production is currently used at a number of Arla’s other sites, this will be the first on this scale in the dairy industry. The new facility will be of the highest quality, and will have total flexibility, allowing Arla to react quickly to customer requirements in today’s challenging dairy market. Alpla has considerable experience in the plastic bottle market, having in-plant facilities at blue chip companies all over the world (including five in the UK), as well as two stand-alone UK sites in Milton Keynes and Manchester, ensuring Arla has good supply contingency to support the company’s changing requirements. Use of Recycled HDPE in Milk Bottles Expands in the U.K. 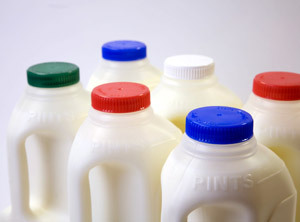 The Co-operative Food has become the first retailer to reduce the tint in all of its own-brand plastic coloured milk bottle tops, making it easier for them to be recycled into new bottles. The Co-operative sells 202 million bottles of milk every year, and previously, the amount of recycled plastic that can be used to make new clear milk bottles was limited because bottle tops colour the material. The move will mean that the retailer will potentially increase the recycled content of plastic milk bottles from 10% to 30% – helping to produce an extra 4,500 tonnes of recyclable material every year. A recent article in Slate, the online magazine, and reprinted by The Washington Post, discusses the varying environmental impacts of different packaging choices for milk. (Read the full article @ http://www.washingtonpost.com/wp-dyn/content/article/2011/02/28/AR2011022804969.html) The three alternatives considered are the HDPE plastic milk jug, the paperboard gable-top carton and the glass bottle. Without restating the entire article here, the author points out the pro’s and con’s of each packaging form. The paperboard gable top carton gets high marks for being produced from largely renewable resources (paperboard), however, it’s positives are overshadowed by resource intensity to produce and mixed materials (coated paperboard, plastic spouts and caps) which hampers recyclability. The author ranks the glass bottle first, despite the fact that it takes more energy to produce and even though it is much heavier than the paper and plastic alternatives. Ranking the glass bottle first is due to his primary assertion that it is reusable / refillable. While in theory, that is true, I don’t think that we’re going back to the days of having the milkman pick up your empties, plus the energy involved in any return scheme has not been factored into his assessment of environmental impact. The author goes on to say, “When it is reclaimed, plastic from milk bottles is usually turned into toothbrushes, flowerpots, and children’s toys, among other things.” While it is true that recycled milk bottles go into all of these applications, the primary use for recycled milk bottles, by far, is to be put back into consumer products packaging. Virtually all national brands of liquid laundry products, household cleaners, shampoos, conditioners and skin care products use recycled milk bottles in their packaging because it is relatively easy to achieve the proper color packaging using colorless, recycled milk bottle plastic resin. We are, also, pleased to say that we are addressing the author’s comment that “…none of the milk containers in the United States are actually made from recycled materials”. Envision Plastics’ EcoPrime™ food grade recycled HDPE resin will be incorporated into dairy products and milk bottle packaging this year. EcoPrime™ is the only post consumer recycled HDPE resin that has received FDA clearance to be used in packaging that is in direct contact with foods and beverages. This means that EcoPrime™ is free of chemical, bacterial, or any other type of contaminants and that it meets the “strict FDA’s guidelines for the manufacture of food packaging from such secondhand sources”. Look for it in milk, liquid dairy products, beverages, nutritional products and personal care products. You can be assured that EcoPrime™ is the cleanest, purest recycled HDPE resin available anywhere in the world. Need more information? Visit, www.envisionplastic.com/ecoprime.html or contact Envision Plastics Vice President, Tamsin Ettefagh. She will be happy to discuss your comments or concerns in greater depth. Contact her at 336/342-4749 Ext 225.